Although I can splurge on certain things, I cannot bring myself to spend a couple of hard earning bucks on one itsy, bitsy, tiny yummy macaron. I love these miniature yummy morsels, but why do they have to be so darn expensive?! To put things into perspective, $5 for 1 minute of satisfaction or depending on how fast you can devour the thing. This doesn’t sit well w/ me. Is it that intricate to make? And truly, how hard can it be?! And why do they have to be so tiny? Is there a bigger version w/ a different name?! Well, I am about to find out b/c it’s now my mission in life to make these darn things. I refuse to believe that it’s quite impossible. And to have these EVERY time I have my green tea…is pure heaven. Have you made your own macarons? If so, please share some desperately needed secret recipes/tips! Beauty Addicts – Sephora Gift Cards Giveaways!!! I love French Macarons as well and I recently went to a class to make them. They are not necessarily difficult, but there is definitely a standard order of procedure to making them! I have to get a stand mixer before I attempt making them at home though. I have a hand mixer and hot boiling liquid and hand mixer do not “mix” in my opinion. Let’s start a campaign for mega-macarons! Why go to all that trouble for a morsel? Triple the recipe! Macarons are little discs of heaven. I have never attempted making them, but I hear the procedure can be arduous- perhaps that is why they are priced that way! 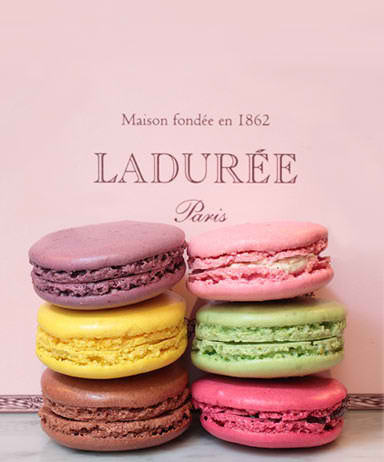 The macaroons in that pic look soooo delicious. I will try and make them now too. I put it on my list. They are so light, how could anyone eat just one? I wonder if there is a world record yet for the largest macaroon made. I’ll have to research that…love your blog. The images, writing and layout “pull you in.” Thanks for sharing. I don’t know if you have a subscription to their website but Cook’s illustrated has a good recipe. Bigger macarons exist and they are called the same! I love macaroons but agree on the price. I am wanting to find a recipe too. Thanks for the post and best of luck to us both! I wish I could make these, but it seems so complicated. Guess I’ll have to splurge on occassion. They do look pretty and yummy. But imagine how many more calories they’d be if they were larger? Hey, if you figure out how to make them, you could sell them: The People’s Macaroon. One tip from a class I took and lessons learned, is to really try to savor the moment with that delightful piece of food. Be present with it. Take it in with all your senses- smell it, notice it’s texture, imagine it was the last one on earth as you partake. It might be hard to find the time to do this type of focus with a baby around but it could stretch your cost per minute dollars further and make it feel less expensive if you can take 10 minutes to enjoy it, instead. :). If none of that works, I think Trader Joe’s sells them in tubs. having a few is such a treat! but true, they are pretty pricey. I’d like to try making my own too, just haven’t gotten to it yet. Love eating these but have never tried making them! Your blog is lovely! Saw that you had checked out my brand new blog… thanks! Good for you, making your own. Never underestimate a woman on a mission! I love them too!!!! There is Maison du Macaron in Montreal http://www.lamaisondumacaron.com/pages/desserts.html (sorry it is in French) and they have the regular size macarons (6,5 cm)+ desserts macaroons (10 cm)…they wrote a book about how to make macarons…in French….but you can check their website, just for the visual…. Oooooh if you make them and do it right – I’m so jealous! Don’t you need low humidity and cool temperatures? I make them often. Are you looking for a recipe? The key is consistency and timing. The first few tries are usually a disaster, but you do get the hang of it. When you get used to it, you can play with colour and fun new recipes. I have had to google a lot to get tips and tricks.